ASUS India has finally launched (the company had earlier put a teaser of the same on its site) the Fonepad tablet in the Indian market. The tablet runs on the Android operating system and will be available for a price of Rs 15,999 across Croma stores and select ASUS authorized retail outlets starting April 30, 2013. Here is a look at the specifications of the device. The Fonepad sports a 7 inch WXGA LED backlit IPS HD touchscreen display (1280x800 pixel resolution) and runs on the Android 4.1 Jelly Bean operating system. It is powered by a 1.2 GHz Intel Atom Z2420 processor and has 1GB of RAM. The internal memory of the device is 8GB, which can be further expanded up to 32GB with a microSD card. Users also get 5GB of free lifetime ASUS WebStorage with the tablet for syncing and sharing data with other devices. On the camera front, it features a 3 megapixel autofocus rear camera that can also record high definition videos (720p), and a 1.2-megapixel front facing camera for video calling. On the connectivity front, it has Wi-Fi, Bluetooth 3.0, as well as a microSD card slot. The device is 10.4mm in thickness and its weight is 340 grams. The company has provided a 4,270 mAh battery that it claims will provide up to nine hours of battery life. 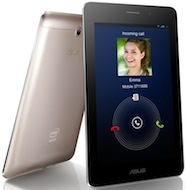 The tablet also has ASUS's SonicMaster audio technology for better sound quality. The device has micro-SIM support, and comes with built-in 3G for mobile data and telephony, hence it can be used for voice calling. The company has also provided a number of apps in the device that includes Floating app- for easy management of running apps and multi-tasking; SuperNote- for handwritten notes and drawing; and WebStorage Office Online- for editing of Microsoft Office compatible documents. ASUS has also provided an optional accessory (a wraparound cover) called VersaSleeve 7 for the tablet that will be available in four colors. "Users now want a better screen with entertainment, social media and other online activities. By incorporating 3G mobile data connectivity with full telephony support, we have made ASUS Fonepad a combination of a tablet and smartphone," said Peter Chang, regional director- South Asia and country manager, System Business Group at ASUS India. In the same price range, the tablet will compete with iBall Slide 3G (Rs 15,990), Lenovo Ideapad A1 (Rs 15,628), Samsung Galaxy Tab 2 (Rs 15,990), Viewsonic ViewPad 7 (Rs 14,790) and ASUS's own Google Nexus 7 (Rs 15,999), among others. Although most of these tablets do not support 3G and voice calling, hence the Fonepad scores a brownie point there. People looking for a mid-price range tablet can give it a chance, but don't blame us if others find you weird holding a 7 inch tablet to your ears.